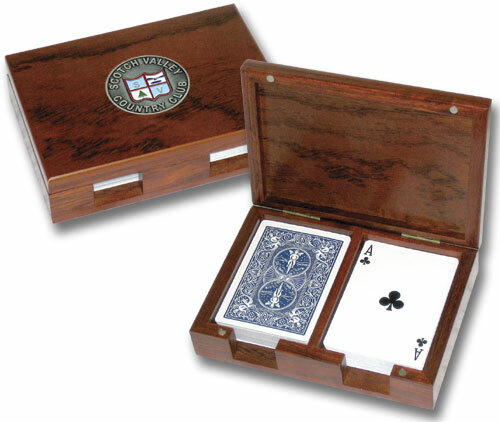 Our wooden playing card boxes are available to hold single and double decks of playing cards. 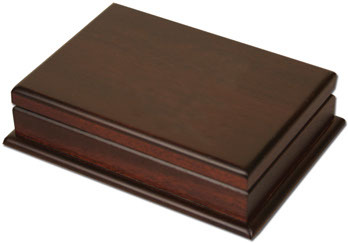 Below is a selection of wooden playing card box styles and custom wood finishes that are available for custom engraving. 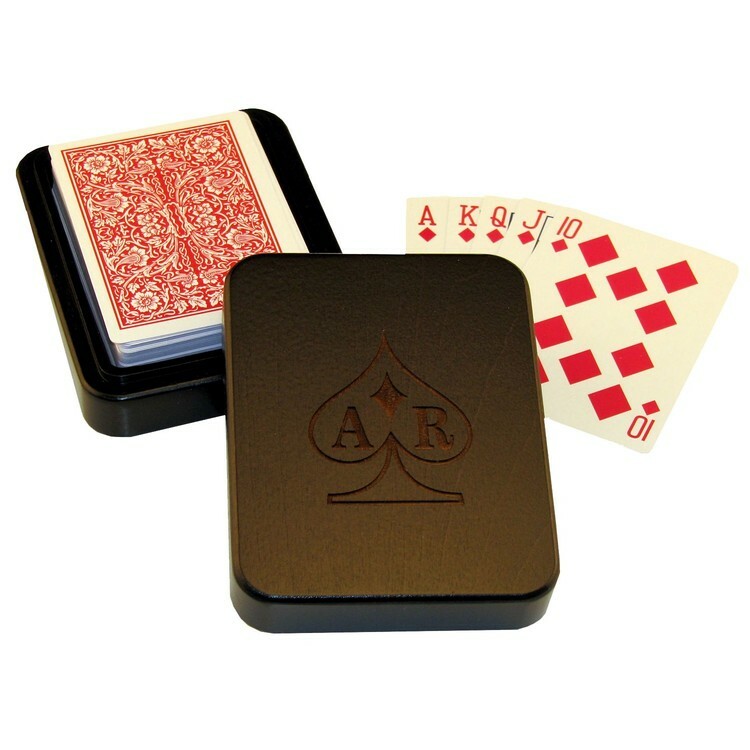 Custom engraved playing card boxes feature a felt lining, superior workmanship and attention to detail. 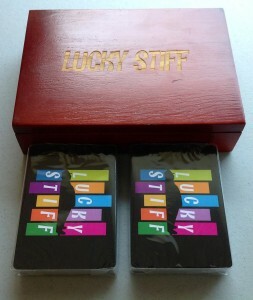 Made to hold poker size cards that measure 2.5 x 3.5 in size - they can also hold bridge sized playing cards as well. 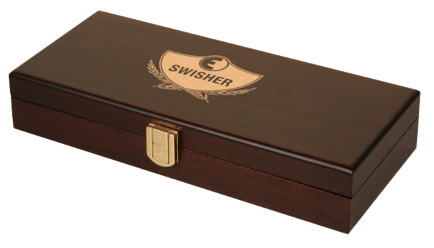 Each wood finish causes the engraving to appear differently so that one box can have many unique finished looks. 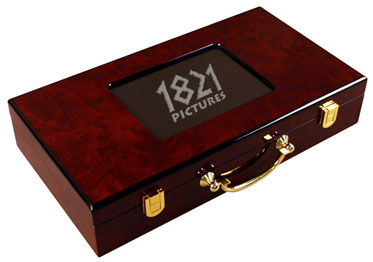 When providing artwork for custom engraved playing card boxes - please be sure to provide 1 color vector art files. This mahogany finish represents the color of aged mahogany after exposure to light over many years. This finish has been made popular primarily in the furniture industry and to a lesser extent by the musical instrument industry. It is often confused with rosewood and aged cherry. Infact, after many years it can be very difficult to tell the difference between aged cherry and dark red mahogany, other than from the grain pattern. 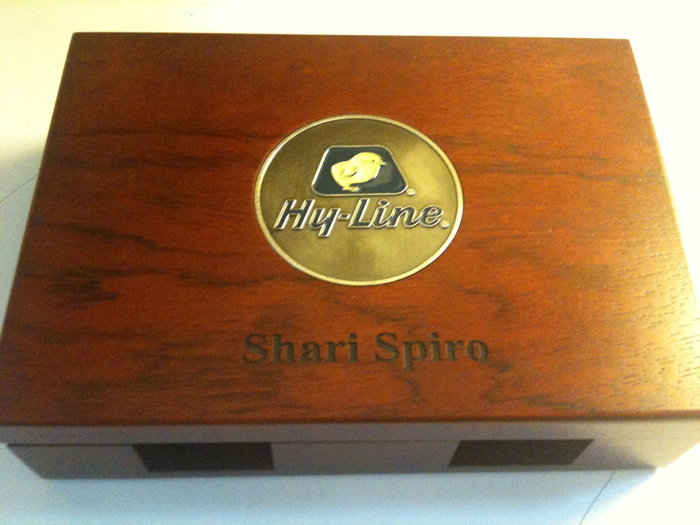 This wood laser engraves and stains very well and is medium hard. The wood is a pinkish blonde color when cut, but eventually "ages" to deep red hues when exposed to air and light. Cherry can contain brown pith flecks and gum pockets, which are both natural characteristic of the wood. A slightly darker look this finish exemplifies its name "Black Walnut". Genuine Walnut varies in wood color from light brown to deep chocolate brown. Customers looking for a consistent dark rich color often select this finish. Also used for the very popular mocha brown finishes used by interior designers today. This finish still laser engraves nicely, but the contrast is a bit more subtle. 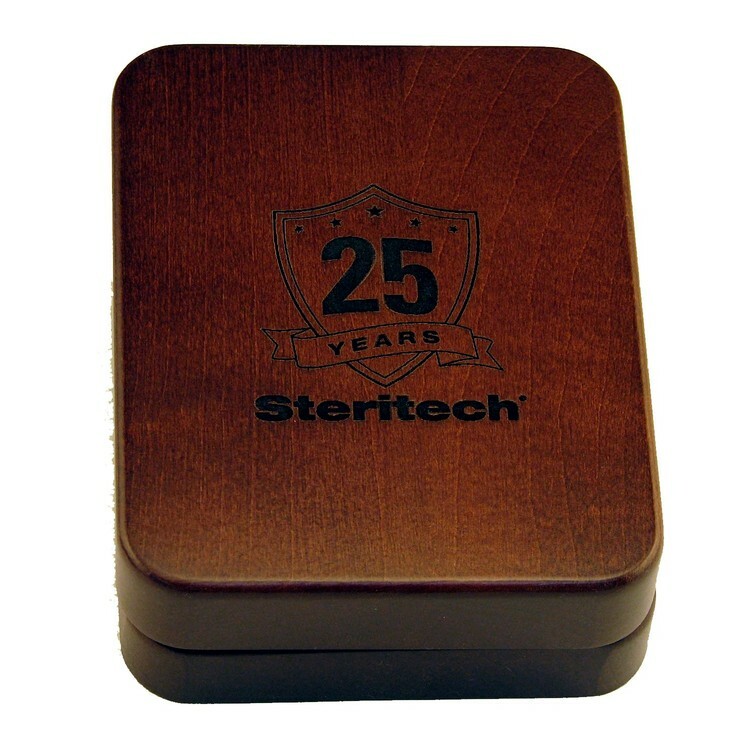 Often referred to as Black walnut and American Walnut, it laser engraves well and is the only dark" American hardwood. The wood color ranges from light brown to deep chocolate brown with a strong grain pattern and can sometimes contain a hint of purple. For us, rosewood is a finish, not the real wood. The wood itself is now a CITIES-listed endangered species. We use only American hardwoods to create a rosewood finish which many clients feel is the closest match to the real wood available. Same beauty, but being environmentally responsible. All of our rosewood pens are produced from readily available substitutes not on the endangered list. This wood is very finely textured and moderately hard for a softwood species. This wood has made its reputation in cedar chests and closet liners for its unique fragrance; a strong cedar scent. Due to this attribute, many products produced in this wood are left unfinished to allow the fragrance to be more prominent. This unique finish is often thought of as contemporary, but it is actually nearly as long lived as some of the classics. The beauty of the wood is not hidden by this finish as it is completely translucent and allows the grain to show through. Grows throughout the eastern United States. Hard and soft maple are very similar and make up 8% of the commercial hardwoods. Trees mature in 25-40 years. 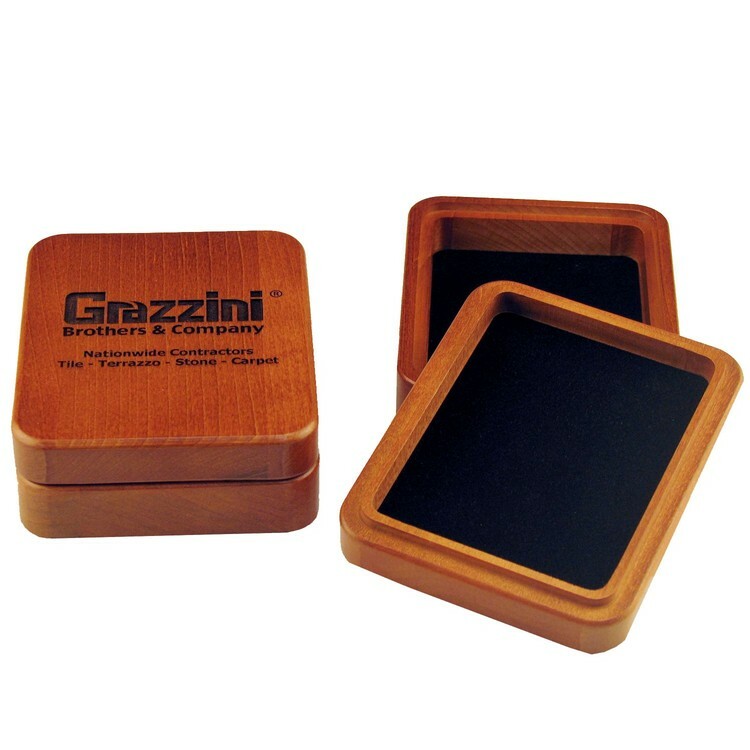 It laser engraves and stains well and is often used as a substitute for cherry. A traditional cutting board wood, also used for flooring, cabinets and furniture, it is a cream color with a light yellow to brownish tinge. Continuing all of the characteristics of Maple, the Honey Maple finish adds a warming hue to this strong wood. Honey Maple is a nice option between the Maple and Alder colors. For customers looking for the warmth of Alder, but wanting a stronger and harder wood, this is the perfect choice for them. This color is often selected by customers looking to create "theme feel" for a rustic, country or Southwestern look for their project. This opaque finish can be applied over any wood. This selection comes in in three (3) sheens; matte, satin, or semi-gloss. Not recommended for high use items. The higher the gloss level, surface deviations are more noticeable as well as fingerprints and smudges. This finish has a 10% cost premium added to the price. These options hold either one deck of cards or one deck of cards plus five dice. Our wooden double playing card box is made from hand rubbed, solid rosewood and holds two decks of poker sized playing cards side by side. 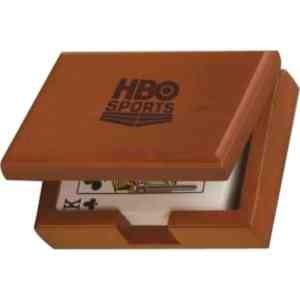 The box includes a 2" Custom Medallion mounted on the cover. The medallion is offered in both gold or silver and can be filled with color if desired. 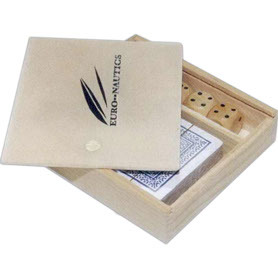 Comes in either a double deck wooden playing card box with engraved lid or a high end double deck wooden playing card box with engravable lid. These wooden poker chip boxes hold two decks of cards and poker chips. Each of these boxes holds 300 custom poker chips but boxes are available to hold 100, 250, 300, 500 and 1000 poker chips and two custom decks of playing cards.